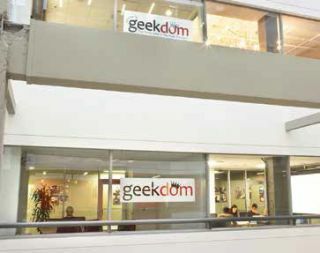 Geekdom has just entered its first school partnership with CAST high school. The school will work with industry partners, including Geekdom, to prepare students for careers in technology and business. They use computer-based learning to allow students to progress quickly in their areas of interest and college coursework, and students will graduate with a high-school diploma as well as an associate’s degree, industry certifications, and portfolios that feature examples of their work. Many of these students will be ready for good tech jobs when they graduate. Garcia spoke to T&L leaders about how Geekdom can be a model for K–12 schools that want to better prepare their students for a collaborative, project-based learning environment. A panel of experienced district leaders opened the Summit with a series of mini-keynotes, sharing their thoughts around innovation in K–12 schools. When starting to innovate, you have to overcome your fear and go big. In 2014, we went to our corporate and community partners to help fund some innovative ideas. The district would support the ideas with human capital. What we did was innovative three years ago, not necessarily today: we implemented immersive virtual worlds, makerspaces, and the STEAM model in curriculum. How do you know if it’s innovation or renovation? Defining that is the hard part. Renovation is more frequent than innovation, but we’re learning how to develop and support an innovative culture. Innovative spaces change pedagogy. We built a new middle-school fitness center with a ten-foot video wall with biometrics and a sound system. Technology is changing how kids interact with themselves. We also designed our 1:1 with a space where kids can move within the walls to collaborate and communicate—moving in and out of spaces with their laptops. We built flexible spaces. We have no lockers in our new high schools. We replaced them with charging stations and benches. We’ve blown out the walls of traditional spaces and let kids define the learning spaces for themselves. We’ve also seen a big gain in teacher performance because teachers and students feel comfortable in the spaces. Connecting the dots is innovation. How do you systematize for innovation? To deal with poverty issues, we chose Kajeet hot spots so that students can check out laptops and take them home. Data limitations were not a problem because of our filters. When we started in 2013 with 4G, I brought Sprint and Kajeet to the district table to make sure it worked before we introduced it to kids and families. We also did massive training, sending out tech integrators and media specialists to open houses to speak to families. We made sure that families had all the information to make this work. We were recognized by the state legislature because of our innovative approach. Now that we’ve built a strategic structure, when we have innovative ideas, we’ve got a framework to make them happen. Engage. Inspire. Empower. In order for us to innovate, we have to reset and respect the past. What was great about the past? The relationships teachers had with students. We want to celebrate the best of that, but our learning environments have to change for innovation to take place. Nothing is more important than relationships, and technology can humanize relationships. Communication is a leader’s best friend. There are other places we can look to for inspiration. Look at garbage trucks; they provide an innovation model to help us to understand how to transform what we’re doing. The world is now at our fingertips. R.J. Gravel, Assistant Superintendent for Business Services at Glenbrook (IL) High School District 225, discussed how they handled a security breach situation. “We recently experienced a substantial phishing incident initiated by our students, which resulted in a national news story,” he said. He went on to share details of the incident, then he explained their approach to measure the impact of the actions on the district and discussed the education/policy changes they made to minimize potential incidents in the future. To see the process in detail , view the presentation at http://bit.ly/2uFWDTH. Just shares some extensive schematics on district provisioning at http://tinyurl.com/yabrjjer. When we discuss equity in education, we usually think about devices and Internet connections, which of course are vital to ensuring all students have equal access to learning opportunities. But how are districts ensuring all voices are heard and seen in their edtech programs? Attendees in the “equity and diversity” workgroup shared their ideas and solutions. Art Fessler, Superintendent at Community (IL) Consolidated School District 59, said they launched a department of SEL and student equity three years ago. “The leadership in the department offers a significant amount of diversity and culture awareness training with all staff and leaders. We have also brought in guest speakers to help students see models that look like them. The discussion around the topic of digital citizenship focused mainly on tools, with Common Sense Media being the most widely embraced resource. Chris Stengel, Director of Technology at Mt. Lebanon (PA) School District, said his district partners with Common Sense Media and the district librarians deliver their digital citizenship curriculum, which has been a great success at their elementary buildings. “We also work with our PTAs to have parent education events where we stress the importance of parent-student communication for safety and citizenship issues,” he said. Now that digital curriculum requires a partnership between IT teams and curriculum and instruction teams, this working group had a vigorous discussion about how communication between the two groups happens in districts. While one or two participants felt that districts have been having the same conversation for more than 20 years, there was a general acknowledgement that those who want to control change have to be change agents. Sandra Paul, Director of Information Technology, Union (NJ) Public Schools, said that she works closely with her curriculum team. “My biggest thing is that instruction should drive technology,” she said. Recently, she angered someone for not ordering SMART Boards because they hadn’t articulated an instructional rationale for the purchase. “What are the best learning spaces to support students in their journey to be successful for life?” According to Superintendent Art Fessler, that’s the question Community (IL) Consolidated School District 59 set out to answer before redesigning their classrooms. From there they created prototype rooms, each with a variety of “learning zones” and furniture types, and gathered teacher and student feedback before expanding to additional rooms. Elizabeth Freeman, Director of Innovative Learning for Fremont (IL) School District 79, explained that her district also began with prototypes and a focus on the types of learning the redesign was meant to address. In addition, they held a student contest to redesign the library, which was renamed the Wildcat DEN (Designing, Exploring, Networking). Linwood (NJ) Public Schools took student involvement one step further. “We created a design and fabrication studio with a grant-funded CNC overarm router,” explained Frank Pileiro, Supervisor of Technology. Students then used opendesk.cc designs to build furniture and redesign their own studio. The results were so attractive, practical, and affordable that the students have been asked to create furniture and displays for other parts of the school. Jean Tower, Director of Media and Digital Learning for Needham (MA) Public Schools, said that the language schools use in describing spaces is an important aspect of the redesign process. “We are transitioning former computer labs into ‘innovation studios’ with stop motion stations, sound booths, and other spaces designed to encourage collaborative work and creation,” she said. ● Rugs and cushions that help create separate spaces and make for comfy floor seating. District leaders were excited to share some of their innovative approaches to professional development. That being said, Kuzo and others in the group discussing the return on investment (ROI) of 1:1 do use data to determine the best ways to use technology. Matt Penner, Director of Information Technology and Instructional Technology at Val Verde (CA) USD, noted that we need to start by defining the ‘R’ in ROI—we need to know what sort of “Returns” we’re looking for. He used this image to show how our world is changing and to illustrate the importance of innovation when preparing students for jobs that have not yet been invented. Lynn Swanson, Instructional Technology Coordinator at Cary (IL) School District 26, added that “the innovation is in the pedagogy, not the technology.” Her district’s goals include transforming students from consumers to creators of content, and teachers from disseminators to facilitators. So how does one measure progress towards such goals? “Preparing our students for success goes far beyond test scores,” said Adrian Acosta, Director of Instructional Technology at Houston (TX) ISD. ● Student, teacher, and parent surveys to gather data on engagement levels. ● Tracking SIS data on such things as attendance, disciplinary actions, graduation rates, types of classes taken, and student involvement in after-school programs. ● Examining LMS data with regard to which applications are being used, how much time students in various classes are logged in, etc. ● Classroom observations using a rubric to measure progress on specific goals. ● Using a data warehouse to track longitudinal data in order to observe trends and correlations over a period of several years. ● Other anecdotal data aimed at discovering unexpected results.